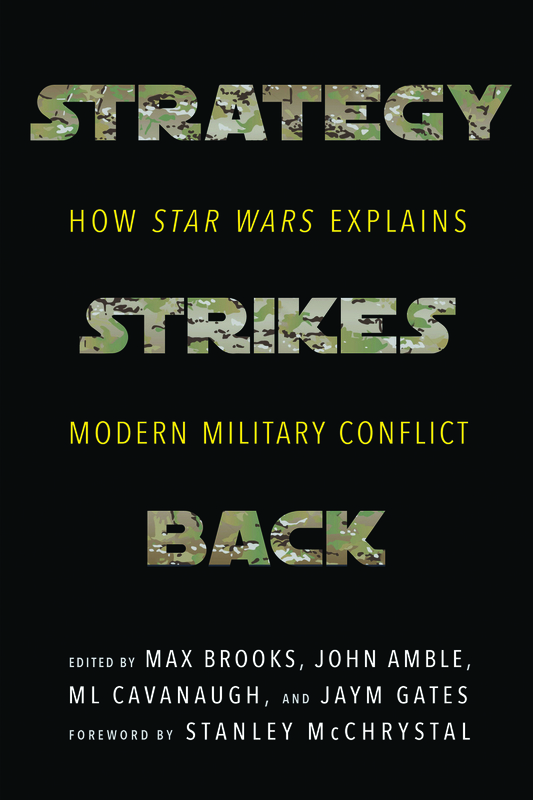 This is a thing that I'm a part of: Strategy Strikes Back: How Star Wars Explains Modern Military Conflict. The book is edited by my War Stories editing partner Jaym Gates, as well as Max Brooks (yes, that Max Brooks), ML Cavanaugh, and John Amble. It also has a foreword by Gen (RET) Stanley McChrystal (yes, that Stanley McChrystal). The book s hitting stores in May, and you can pre-order it from the University of Nebraska Press or Amazon. The book came about out of a funny way. While I was freelancing, I pitched a series of articles to StarWars.com, a series of military history-style reports about the various notable battles in the Star Wars films, cartoons, and books. The original essay went through a couple of editing rounds, but it ultimately wasn't a good fit, and I intended to post it here. But I ended up sending it over to August Cole, of the Atlantic Institute and co-author of Ghost Fleet: A Novel of the Next World War, with the idea that it might be a good fit with his own site. Somewhere along the line, the idea turned into a book, and it became Strategy Strikes Back. Along the way, it picked up some interesting authors and essays, including my essay about the Battle of Hoth and the tactical reasons for why the Empire not only lost the battle, but missed a critical point to eliminate the Rebellion because of its mistakes. There's also essays about Clones and Stormtroopers being too distant from the societies that they serve, the destruction of Alderaan, the Jedi and professional militaries, and more. There's also another Norwich MMH alum, BJ Armstrong, in the mix. I've just finished looking over page proofs of the book, and now, it's just going to be a little bit of time before it hits stores. For a while now, I've been feeling guilty about the number of links I've been foisting on friends on Facebook - it's increased as I've taken on more freelance work. To alleviate this, I've set up a personal page, which will feature all of the things that I've been writing, and other SF/Writing type links that I find interesting. You can like the page here. I've had an uptick in people in the SF community sending me friend requests, and while I like networking, I've been increasingly feeling like my profile is something I'm going to lock down a bit more and keep it more for friends and family that I actually know. The page will be for everyone, though! 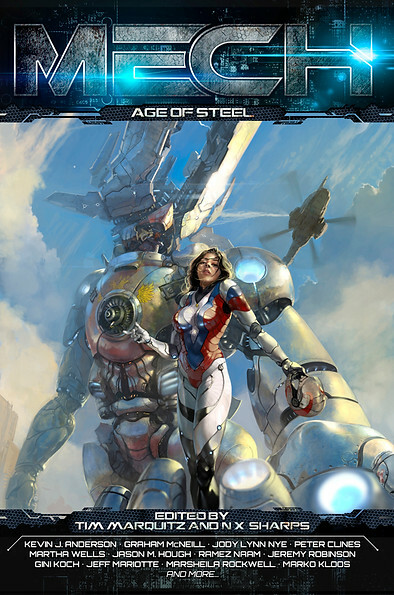 So, this is a project that I've been involved with: Mech: Age of Steel! It's a science fiction anthology all about, well, giant mecha. I've got a short story that I'm writing included in the table of contents. The book's Kickstarter just launched, and you can take a look here. 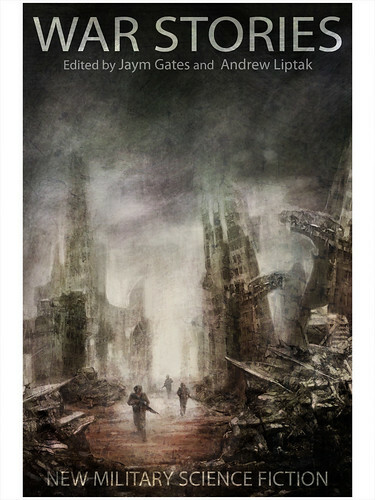 I'm pretty excited about this anthology as a whole - there's some great authors in the Table of Contents. I'm also excited about my own story, which is something that I've been working on for a while now. 'Battlefield Recovery' is about a technician who is dropped onto the battlefield to recover a damaged mech, and finds that it's more complicated than originally thought. So, go pledge! I want this book in my hands! Growing up a bookworm in Central Vermont, there weren't a lot of places to go to buy books. However, I could reliably find something to read in Montpelier, which boasted the now gone Yankee Paperback Exchange, Rivendell Books, and Bear Pond Books. Bear Pond Books is the epitome of what an indie bookstore should be like: well curated selection of books, complete with creaky wooden floors. I've long been a fan of the place, and I'm happy to say that I'm now working there: I've accepted a position as their Events and Marketing Coordinator. I'll be playing with the website, and I'll be planning and scheduling all of their IRL events. I'm really excited about this: not only is it a bookstore that I've shopped at for as long as I've been buying books, I get to do things that I've been doing with Geek Mountain State: bring authors to talk about their work. In all likelihood, the Vermont SF Writer's Series will find a home base here, at least part of the time, and I've already begun planning the first of what will be some exciting events in the next couple of months. 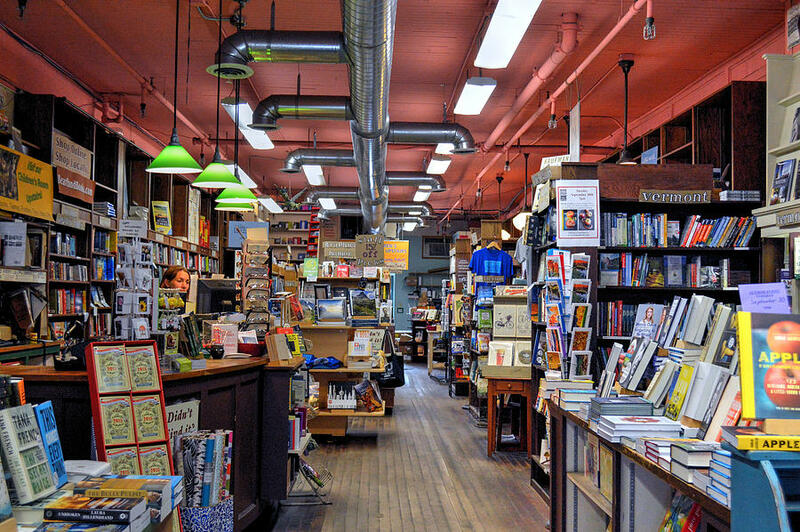 I've worked in a bookstore before: I spent a couple of years at Walden Books in the Berlin Mall, which was quite a bit of fun, and I've been wanting to get back into the bookselling business once again. On December 23rd, I left my job at Norwich University. It's one of those things that's been a long time coming. As I began to do more work with places like io9 and Barnes and Noble, I came to a conclusion: I can do one of those two jobs well, but not both. So, I opted for the one that brought me more satisfaction. I'm now completely freelance, and I'm excited by the possibilities (let's check in on that in a couple of months), and the time that it'll afford me to research and explore some interesting things. I haven't left Norwich completely - there's a saying: Norwich Forever! and ever and ever. - I'm now teaching for their undergraduate program. My first class, ENG250B, Crime and Literature, begins today. In addition to that, I've got an impressive stack of books that I've been wanting to read and review (which I can now do), a bunch of science fiction / fantasy / science / history topics that I want to dig into, and a couple of enterprise projects that I'll be doing. Then, there's a couple of TV recaps that I'm doing, as well as my regular Kirkus column. What excites me more, however, is what I can now say 'YES' to. There's a couple of places that I've spoken with about writing, but have never really had the time to do anything with. Plus, my cat is happy that I'm home. He's already climbed into my lap to take a nap. So, here's a bit of news: I'm now the Weekend Editor of io9! I've been writing off and on for the site for a number of years, but this will be a bit different: I'll be running the show on Saturdays and Sundays, featuring a wide range of fun science fiction, fantasy, news and science stuff. I've been on the job for the past two weekends, and I've been loving it so far! I'm still going to be writing for places such as Barnes and Noble and Kirkus Reviews. Because of this, I'm making some changes in how I consider books for review. I still don't review unsolicited stuff here, but I do consider it for places like B&N, io9 and other places. If you want me to look at a book, e-mail me at andrew[dot]liptak[at]io9[dot]com. If it interests me, I'll be in touch. The full schedule for the weekend can be found here! Public service announcement: Apex Publications has discounted War Stories: New Military Science Fiction in light of Veteran's Day today. You can pick up the book for 40% off the cover price (print and eBook) directly from their website. The sale will run today through midnight tomorrow. If you've been looking to pick up a copy, now's a good opportunity to do so! In other news, the book has been picking up some very good reviews, which I'm happy about. The Atlantic Council (via their Art of Future War project) called War Stories "a superb anthology with the kind of diverse insights and compelling narratives that make it a very practical book for national security professionals as much as it is a highly enjoyable read for die-hard military sci-fi fans. " You can read the rest of the review here, as well as a short interview with Jaym and myself! SF Book Reviews noted "War Stories is a collection of excellent works and undoubtedly an impressive tome for the bookshelf," and you can read the rest of the review here. So, feel free to pick it up! I'm happy to say that I am now represented by Kelli Christiansen of Bibliobibuli Professional Editorial Services, who recently made the jump from the editorial side of the publishing industry to representing clients. I met her last year while she was representing a publisher, and while that didn't pan out, she remained interested and excited about the project that proposed early on. She'll continue to work with myself and my wife on it in the near future. She has an excellent background in the types of books that I'd like to be researching and writing, and it felt like an immediate fit. We've got a couple of proposals in the fire right now, both non-fiction, which will hopefully come to something in the reasonably near future. In the meantime, time to write! I'm pretty thrilled to have this land here. I'm a big fan of the books that Jurassic London has put out, especially their short fiction anthologies: The Lowest Heaven was a fantastic read, and I'm eagerly getting ready to read their latest, Book of the Dead. This book isn't going to be a collection of the columns, but they are going to form a bit of the backbone. My aim here is to look at the history of the genre and its relationship with the readers and authors, but also the relationship between society and technology. In my work with Kirkus, I've been trying to emphasize some of the important, but lesser known authors and editors working within the genre, and I'm hoping that it'll be a nice addition to some of the other popular works on SF history. This is going to be Jurassic London's first foray into original non-fiction, and while we don't have a title for this book yet, we are aiming for an early 2015 release. Read their release here. The War Stories Anthology Kickstarter launches in an hour from now. Thank you to everyone who's gotten excited about this project, spread the word, submitted stories and generally put up with us blabbing about it for so long. After a year of planning, it's finally coming together! I'll be posting up a link to the Kickstarter once it's live. The project is now live! If you like Military Science Fiction, or just science fiction in general, please consider taking a look, and sharing word of this with people you know. We have a ton of excellent authors lined up with stories for this book, and it doesn't happen without support of friends, family, fans and the crowd as a whole. Both my co-editor (Jaym Gates) and I feel that Military SF is an important conduit for readers: there's a real lack of understanding between the military and civilian worlds, and we hope that science fiction will be a good way to bridge the gap, and provide some understanding for the real complicated nature of warfare and its impact on the rest of the world. I'm pleased to say that I've just made my first pro fiction sale! My story 'Fragmented' will appear in the new magazine Galaxy's Edge, which has featured authors such as Nancy Kress, Robert J. Sawyer, Kij Johnson, Jack McDevitt, James Patrick Kelly, Mercedes Lackey, Ken Liu, and quite a few others. Fragmented has garnered the usual round of rejections, and I'm happy that this one is my first. Anyone who attended the Geek Mountain State / Renegade Writer's Collective Reading in September heard me read it, and that reading was a crucial element in getting the story properly edited and into the right shape. It's short: around 2700 words, and is about a soldier deployed on a devastating campaign. Galaxy's Edge Magazine is published on a bi-monthly schedule. Stories from the current issue are displayed online, while print and digital copies can be purchased from various online retailers. I'll post links and a bit of background on the story when it's available - I don't know when that is just yet. In the meantime, back to work. Hopefully, this will be a repeatable experiment. Contracts have been signed, the post has been scheduled, and I can announce this now: I've been brought on board Kirkus Reviews as a columnist, where John DeNardo of SF Signal has been writing for the last couple of months. I'm pretty excited about this, because it's an opportunity where I can blend two of my long-standing interests together: History, and Science Fiction. Starting in June, I'll be heading up a bi-weekly column that will examine (in small bites) the history of the science fiction genre by looking at the authors, books, trends and notable events that impacted the speculative fiction genre. Science Fiction history is something that I've picked away at little by little over the years, and I can trace my interests back to a book that I bought in the fall of 2002: Men of Tomorrow: Geeks, Gangsters, and the Birth of the Comic Book, by Gerard Jones, which expertly traces the history of the comic book industry from before its inception, all the way to the 1980s. Since then, I've picked up books over the years, various biographies of some of the greats, scholarly books on the history of the genre, light reading, and things that typically revolve around the inner workings of Science Fiction and Fantasy. To be able to start putting it together, a couple of times a month, is something that I've long wanted to do, but never really had the outlet to do so. Studying the history of anything is important. The present day is a product of the past, and everything that has come before has left its fingerprints in everything that we do. To view anything in a vacuum is to strip it of meaning, and I hope that I'll be able to put together a resource that will inform and enlighten. The first post will be up May 3rd, focusing on Mary Shelley and Geneva. Stay tuned!